HOLIDAY Guesthouse, a short history. 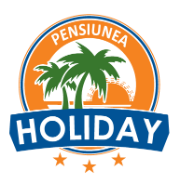 Pensiunea Holiday has been operating since 2005 on a 1 hectare plot of land, being the first private agent to invest in Ocna Sugatag, Maramures, building a recreational base with freshwater and salt water pools, trying to cover a bad niche in this area, coming to the tourists with something new, something that has managed to combine the ancient traditions preserved for hundreds of years in the culinary customs, dance, music and the popular port offering the possibility of the tourist from other places to know them to benefit from spa, treatment and restoration services. Their realization has been done over time, each year brought something new, contributing step by step to what is now: an oasis of relaxation, restoration and good will! Especially on the entertainment side, and great accommodation capacity, as a result their number has increased significantly each year.